Broke couple or two best friends, are you planning a holiday on a tight budget? Let Jaipur be the spot for your next vacay because we’ve found an Airbnb here that accommodates two and costs less than INR 1,300 per night/person. Sudha’s home in the heart of Jaipur faces the Aravali Hills. The guests will also have access to three beautiful terraces (one with a city view), the library, a Buddhism prayer room and a garden in front of the house. From Wifi, parking facilities, private entrance to air conditioning, washer and skincare essentials, this cosy and artistically decorated house offers all the amenities to help you enjoy a happy stay in Jaipur. Sudha has a dog named Booni which is definitely a plus for all the dog-lovers and she even serves complimentary chai and breakfast! When you’re here, you can lounge (or do yoga) in the garden, take the hosts’ optional cooking classes (they’re great cooks), enjoy beautiful views from their terrace, explore the city and do so much more. 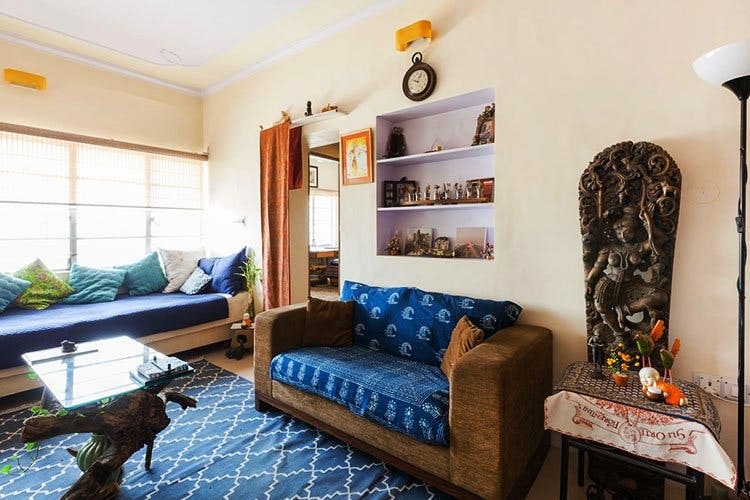 We totally recommend this Airbnb for first-time travellers as the place is in proximity to various restaurants, shopping hubs, entertainment spots and famous Jaipur Forts but is still conveniently located away from all the hustle bustle. They're a bit strict when it comes to smoking and partying, both of which, are not allowed inside the property. However, you can always go outside for the same. Otherwise, you will have the entire place to yourself, so you can still chill without any inhibitions. In case you need any help or advice, the hosts live upstairs and are always happy to help. Go through the reviews and you’ll know that you’re in good hands.